Mr. Coleman is a partner at HCP with extensive experience representing employers in all aspects of work-related injuries. Mr. Coleman is a Board Certified Specialist in workers' compensation law. Whether he is defending workers’ compensation claims, counseling clients on administering claims, or representing employers in related areas of VSSR defense and intentional tort litigation, Mr. Coleman prides himself on strategic analysis and cost-effective representation. He represents employers across Ohio in all areas of industry, from service to heavy manufacturing, health care, and transportation. Mr. Coleman’s clients run the gamut from small employers to Fortune 500 multinational corporations. Mr. Coleman’s practice focuses on defending claims at the administrative level as well as in court appeals or mandamus petitions. He has first chair trial experience and has appeared in numerous courts of appeal and the Ohio Supreme Court. 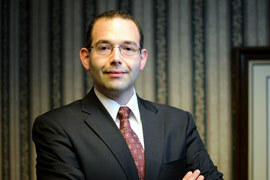 Mr. Coleman is also a member of HCP’s general litigation practice group. Consequently, in addition to representing employers in work injuries, he has extensive experience in insurance defense, municipal law, transportation litigation, construction litigation, employment discrimination and retaliation claims, and personal injury cases. In other words, he brings a wealth of experience and breadth of legal insight to analyzing risk. Tony is a lifelong Ohio resident and has been repeatedly recognized as an Ohio Super Lawyer and Rising Star. He resides in Akron with his wife and three children and can often be found hiking through the Cuyahoga Valley National Park or running along the Towpath Trail.